Ian.... few others would know the place but you will, one of the two best meat pies I ever had was from a Roadhouse in Tambo !!! Damn it was good (or maybe I was just bloody hungry). yep, know Tambo well. I used go up through there from Charleville. Another good pie can be had at Merriwa, I used to pull in there every day when we were getting the bush rock in the mountains outta there. We would get 3 each everyday splotched liberally with tomatoe sauce. A healthier breakfast was never had. I took this picture years ago, I used to pass this headstone sitting out in a paddock on its own near a little town called Gungal. So I happened to walk over to it one day. 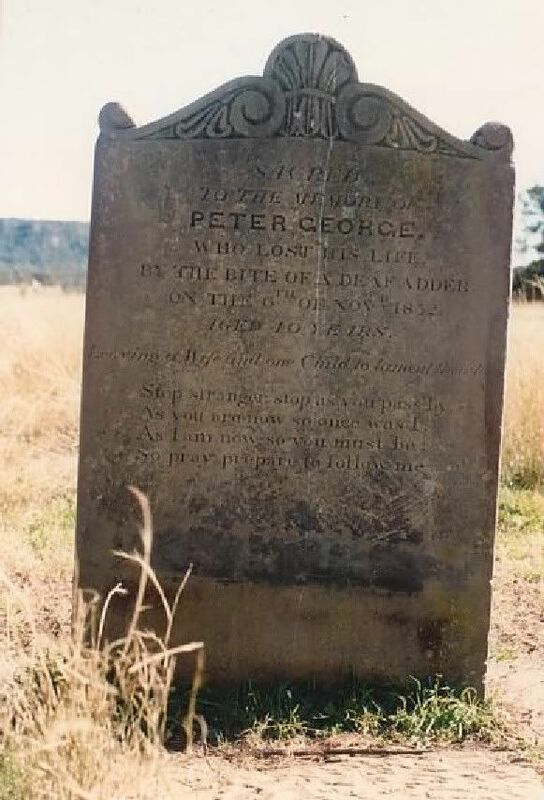 By blowing the picture up, it appears to be the headstone of a 10 year old boy, died in either 1832 or 1852. It's also misspelled as Deaf Adder. Being not far from where I lived, Death Adders are prominent all through that area. One of the Places I lived was alive with these. That looks so sad and desolate. Yes I agree, there's no farm houses around it, though Gungal is only a mile or so away from it. If you could call it a town, from memory there's only a church and an old telephone exchange there with a couple of houses. I think the old girl that ran the exchange name was Mavis. All of our calls from Baerami used to go through her exchange and we could hear her breathing as we were talking, everyone knew she listened in on all of the conversations, but just got used to it. She was probably desperate for company or to hear another human voice. When we first moved here in S/W Missouri we were on a "party line", connected to three other homes. If someone was on the phone any of the other three could just pick up and listen in. I was interrupted more than once because there were cattle in the road. I've been on a party line as well, forget where, but it was never private, just when you thought you had privacy, you'd here click and somebody would hang up. Anymore, even the computer listens in on you! Rat chat was about to fall to the second page. We can't let that happen. I'll make it a sticky so it remains alive. Generated in 0.165 seconds in which 0.151 seconds were spent on a total of 14 queries. Zlib compression enabled.